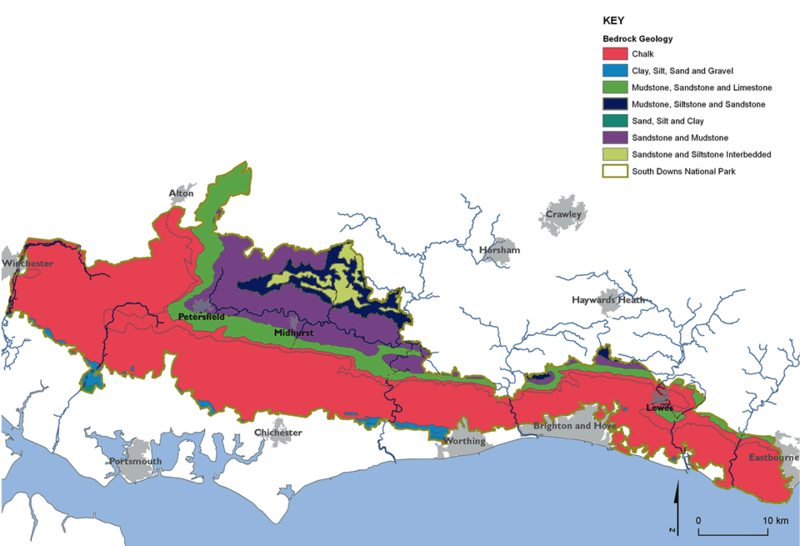 Map 2.2 The solid (bedrock) geology of the South downs National Park Maps prepared by: GeoSpec, University of Brighton; February 2012. Source: British Geological Survey, 2008 Ordnance Survey Crown Copyright © Licence No. 100050083. Map 2.3 Main soil types found within the South Downs National Park Maps prepared by: GeoSpec, University of Brighton; February 2012. Source: National Soil Resources Institute, Cranfield University, 2001 Ordnance Survey Crown Copyright © Licence No. 100050083. How rivers work: explaining the important role that groundwater plays in the environment. Geology is the study of the structure and the origin of the planet earth through understanding the formation of its rocks, minerals, fossils and soils. Through studying the fossil record we can also learn and understand more about ancient life. Some geological formations or sites may be the only place this series of events, or fossil record, are captured, so it is often very important to preserve these as a record. In the South Downs the main geological units are chalk, greensands and clays. The chalk sits on top of earlier marine deposits of greensands and gault clay, and terrestrial deposits of the wealden sandstones and clays, all laid down during the 45 million years before the chalk. During the Cretaceous period between 75 and 90 million years ago this part of the country was under a shallow tropical sea. Chalk muds were laid down at the bottom of this sea and were very thick and widespread. The layers of chalk also contain bands of flint nodules, a common feature of the walls and buildings within the downland villages. These layers (or ‘strata’) were pushed up and gently folded into a huge dome by the same powerful geological processes that formed the Alps during the Alpine Orogeny. 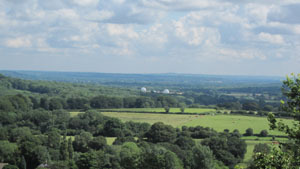 The dome is known as the Weald-Artois Anticline, erosion has removed the softer rocks at the centre of the dome, leaving the two escarpments of the North and South Downs. Weathering and erosion during the last ice age sculpted the landscape into its valleys, distinct hilltops and ridges. The distinctive Greensand ridge shares the same ‘scarp’ and ‘dip’ slope landform as the chalk hills. It was also formed from deposited sands and clays when this part of Britain was under the sea. The chalk layer over it however, has been worn away by weathering and time to leave the complex geology of Lower and Upper Greensand, and Gault Clay. The rocks of the national park are also very important because they are the raw material of the soils and some of the rocks are very important in supplying our water. 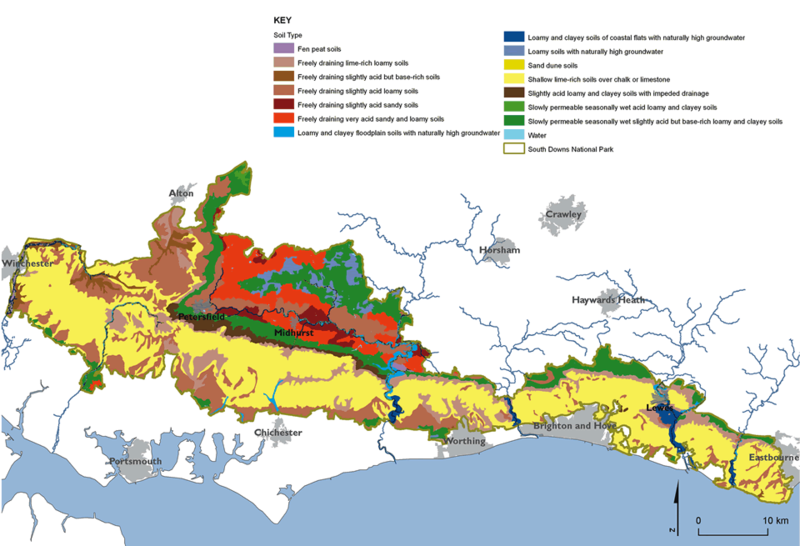 The soils derived from the chalk are mostly thin, well drained and poor in both minerals and nutrients. The sandy soils of the Wealden greensand are acid and also nutrient poor. The chalk acts like a giant sponge, and stores water. This huge underground reservoir (or ‘aquifer’), feeds water from springs into streams and rivers. It also provides most of the residents in and around the Downs with their drinking water. We live in a water-stressed area and it's important we use this precious resource wisely. This presentation provides an introduction to the historic buildings of the South Downs National Park and is particularly useful to schools participating in this year’s annual schools art exhibition, Our Place, setting the context of building materials, chronology and type.